Happy Friday & happy first day of February! 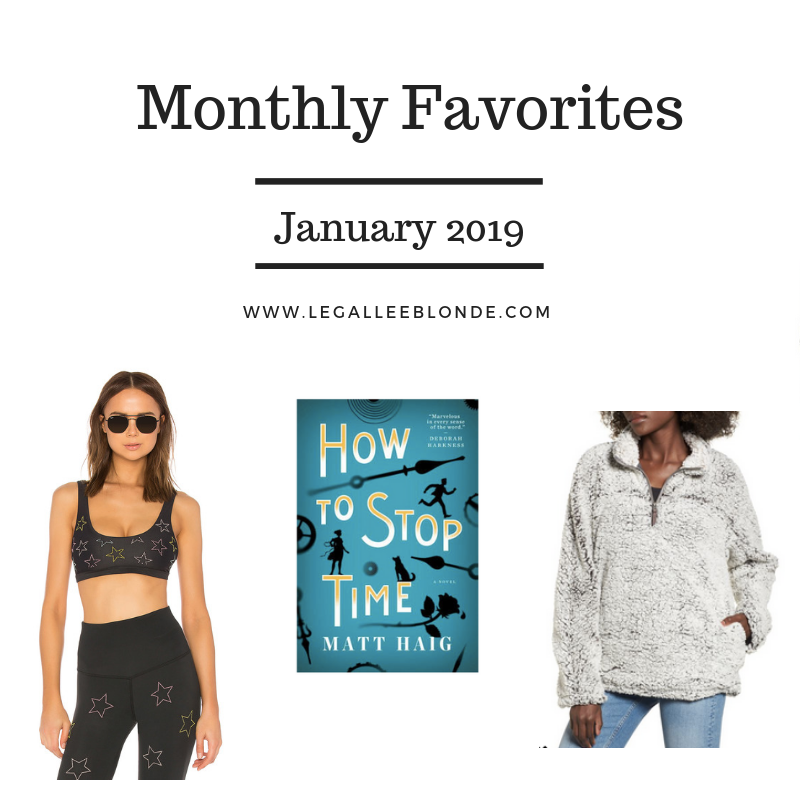 I skipped my monthly favorites post for December (because; let’s be honest, the month of December is really just one big ol’ favorite) so today I am getting back on track with my monthly favorites and sharing my January favorites with you. Fleece Pullover: I know I have talked about this sweater non-stop on my instagram, but it is seriously the most comfortable thing I own! I would wear this every day if I could (I’m wearing it as I’m writing this haha). Affordable Workout Wear: This month I have been on such a binge when it comes to getting new workout clothes. Between my dance classes & yoga/HIIT classes, I’m in activewear a lot, but realized I haven’t updated my workout gear in well over a year. So far this month I’ve got the following pieces – all under $50! Jelly Beam Highlighter: I’ve been obsessed with this highlighter this month. (I’ve talked about it before in this post on my spring makeup). This month with the cold weather my skin has been a bit dry and dull and this highlighter has been amazing for giving me some brightness back! 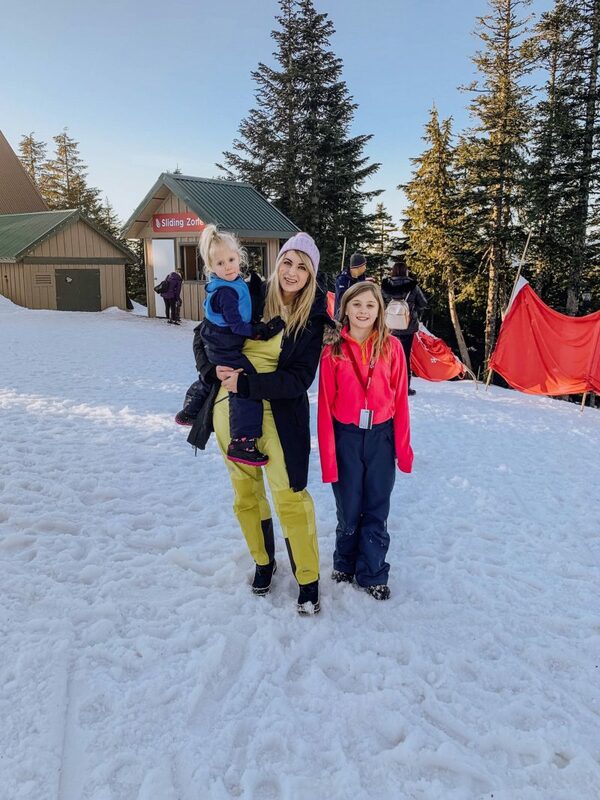 Tobogganing with My Nieces: You may have seen on my insta stories that I took Maia (8) and Sally (3) up Grouse Mountain for some tabogganing / fun in the snow. It was the perfect winter day and the girls were so well behaved and just so much fun. I’m so grateful that my brother lives here in Vancouver now (he was across the country for a while) so that I can see my little munchkins more frequently! Blog Collaboration: This month I signed my biggest brand collaboration to date for LegalLee Blonde; and I am so genuinely excited about it. I have so many fun ideas for content and can’t wait to share it with you. Vancouver Women’s March: I always feel so empowered and inspired when I attend events like this, and this year’s Women’s March here in Vancouver was no exception. Such a great event. “How To Stop Time” by Matt Haig: I cannot recommend this book enough. I read (a lot) and this is now a very close second to my favorite book of all time (East of Eden). It’s really unique, such a great story, but also really makes you reflect and think about life. Future Man: Y’all, this show is awesome. It’s a Seth Rogen / Evan Goldberg production .. so that gives you a sense of the comedic style. Josh Hutcherson stars in it, and honestly it’s just a really light hearted funny show to binge watch. 1. Things to Do When It Rains in Vancouver This Winter: I want to share more local content this year; so this post was a great start. It was really fun to talk about some Vancouver based things. 2. Top Posts of 2018: I’m such a sucker for nostalgia, so I always really love looking back on my year each January. This was fun to do because I looked at my stats to see not what I liked, but what your favorite posts of mine were. Check out this post to see what popular posts you may have missed throughout the year! 1. “How to Set Realistic Fitness Goals” by Blondes and Bagels: Kelsey is great about being honest and open, and this post really resonated with me. I think you guys will like it too! 2. “Faux Fur & Colored Suits” by Atlantic-Pacific: This. Outfit. Post. *cue jaw drop*. I always love Blair’s style, but these suit/faux fur coat combos are particularly awesome. Be forewarned, I felt majorly inspired by these and you’ll be seeing a lot of suit & faux fur coat outfits from me during New York Fashion Week! 3. “Women’s Razor Subscription” by LaurynCakes: A sponsored post on Gillette razors may seem like an odd choice for inclusion on my ‘favorite blog posts’ of the month list. But bear with me. Yes, this is a sponsored post, and no the content is particularly interetsing to me (I use Venus razors) but I love this post because this is just such an awesome example of brand content creation done right. You’ve heard me talk about Lauryn before in my ‘6 instagram accounts to follow in 2019’ post. I’m just blown away by the creativity in her content (how cool are the photos for this razor post?! seriously! I would never have thought to get shots like that) and she is so professional and makes it very clear that the post is sponsored (which too many bloggers don’t). So yep, this post makes my list of January favorites. "Vancouver Hot Chocolate Festival & Must-Have Sweaters"
"3 Galentine’s / Valentine’s Day Outfit Ideas"
Congrats on your brand collab! Tobogganing sounds so fun! And congrats on your big collaboration. I like Future Man, I’m almost done with the second season, but it’s the kind of show I can only watch alone, no one else in my family would enjoy the sci-fi mixed with crass humor, gore, and 80’s references, lol. And omg you just made my day – there are TWO seasons?! I’m almost done season 1 and so thought I was going to be out of new episodes lol, Im so glad there’s a season 2!!! Haha isn’t it! I just love it. And yasss definitely add it. I’d love to hear your thoughts. Can’t wait to hear more about your big blog collab! Congrats girl! Sounds like an amazing month! Definitely checking out your Vancouver post, I’m nearby – in Seattle! Oh that’s awesome! Do you ever come up and visit Van?! You should! I love Seattle, but I havent been down in ages! Congrats on landing your biggest blog collaboration to date!! I can’t wait to hear more!! I love that red workout set. And now I want to read that book ‘How to Stop Time”, think I need to order it. I love that you share your favorite posts by other bloggers, just a great idea. Thank you sou much Deanie!! and yassss the book is so good; I’d love to hear your thoughts! Looks like you had so much fun with your nieces! Also congrats on the collab lady! Haha i totally did. And thank you!!! I’ve been looking for some new workout gear, so thanks for sharing! You’re so welcome! I’ll be sharing more on IG and the like to know it app over the next few weeks! Im actually planning on doing an affordable workout wear try on haul in my instagram stories as soon as Im back from NY fashion week! Vancouver sounds so much fun. Ive been wanting to visit. I am adding How to Stop Time to my book list! You should definitely come visit! It’s such a beautiful city. And yesss, it’s such a great book, I hope you love it! Haha you’re right December is full of faves. That’s my favorite Sherpa pullover everrrr. It’s so cozy! Can’t wait to learn more about your brand collab! Isn’t it the coziest!?! I can’t believe I waited so long to pull the trigger and buy it. I want to live in it, it’s so darn soft! I need to check out that show! I am HUGE Seth Rogan fan! Haha I was so pleasantly surprised by it; I love it! !